n-Propyl Acetate / N Propyl acetate is a colorless, volatile solvent with an odor similar to acetone. It is an active solvent for nitrocellulose, cellulose acetate butyrate, polyester, alkyd, and acrylic resins. It is miscible with many organic solvents (alcohols, ketones, aldehydes, ethers, glycols and glycol ethers, but it is only sparingly soluble in water). It has a medium evaporation rate and is a non-HAP solvent. It promotes flow and leveling in a variety of formulations. In-Propyl Acetate / N Propyl acetate is primarily intended as a solvent in the coatings and printing inks industries. Its properties are important for the manufacture and processing of numerous products in these branches of industry, e.g. its good solvent power for many resins, its high volatility, and its mild odour.Another factor of great significance in these branches of industry is that the solvent power and thinnability of n-Propyl Acetate / N Propyl acetate are comparable to those of Ethyl Acetate. For instance, it dissolves many natural and synthetic resins (e.g. 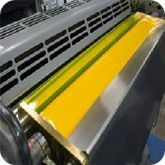 cellulose nitrate, alkyd resins, rosin, plasticizers, waxes, oils and fats) and is thus an eminently suitable solvent for wood lacquers and industrial finishes.The main applications for n-Propyl Acetate / N Propyl acetate in the printing inks industry are flexographic and special screen printing inks.